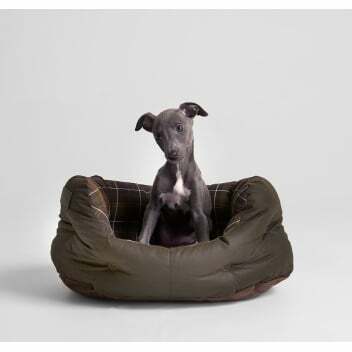 Luxurious and comfortable the Wax/Cotton Dog Bed from Barbour will be a treat for your furry friend. This slumber bed is made in the UK and features a robust waxed cotton outer with a cosy tartan cotton lining. Promising to offer superb comfort it is styled with high sides making sure your pet stays cosy and secure and is finished with a dropped front allowing easy access. This size dog bed is suitable for small dogs such as Chihuahuas and Pomeranians. 100% Waxed Cotton with 100% Cotton tartan - classic.